1）McPhee JT, Hill JS, Eslami M. The impact of gender on presentation, therapy, and mortality of abdominal aortic aneurysm in the United States, 2001-2004. J Vasc Surg 2007; 45:891-9. 2）Kato M, Ohnishi K, Kaneko M, et al. New graftimplanting method for thoracic aortic aneurysm of dissection with a stented graft. Circulation 1996;94 （Suppl II）:II188-93. 3）Ishimaru S, Kawaguchi S, Koizumi N, et al. Preliminary report on prediction of spinal cord ischemia in endovascular repair of thoracic aortic aneurysm by retrievable stent graft. J Thorac Cardiovasc Surg 1998;115:811-8. 4）Inoue K, Sato M, Iwase T, et al. Clinical endovascular placement of branched graft for type B dissection. J Thorac Cardiovasc Surg 1996;112:1111-3. 5）緑川博文、星野俊一、岩谷文夫ら　大動脈瘤に対する ステントグラフト内挿術の成績　日血外会誌 1999;8:34-44. 6）Abbruzzese TA, Kwolek CJ, Brewster DC, et al. Outcomes following endovascular abdominal aneurysm repair （EVAR）: An anatomic and device-specific analysis. J Vasc Surg 2008;48:19-28. 7）吉川公彦、坂口昇二、東浦渉ら　腹部大動脈瘤に対す るゼニスAAA エンドバスキュラーグラフトの臨床治 験成績　J Jpn Coll Angiol 2007;47:53-63. 8）Greenberg RK, Chuter TAM, Sternbergh III WC, et al. Zenith AAA endovascular graft: Intermediate-term results of the US multicenter trial. 2004 J Vasc Surg 39:1209-18. 9）Matsumura J, Brewster DC, Makaroun MS, et al. A multicenter controlled clinical trial of open versus endovascular treatment of abdominal aortic aneurysm. 2003 J Vasc Surg 37:262-71. 10）Wang GJ, Carpenter JP. The powerlink system for endovascular abdominal aortic aneurysm repair: Sixyear results. J Vasc Surg 2008;48:33-45. 11）Bavaria JE, Appoo JJ, Makaroun MS, et al. Endovascular stent grafting versus open surgical repair of descending thoracic aortic aneurysms in low-risk patients: A multicenter comparative trial. J Thorac Cardiovasc Surg 2007;133:369-77. 12）Fairman RM, Criado F, Farber M, et al. 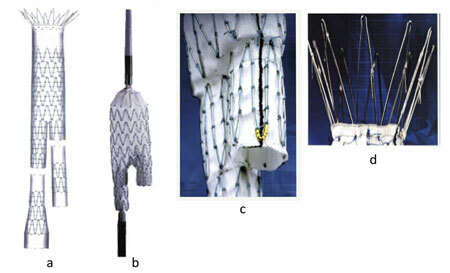 Pivotal results of the Medtronic Vascular Talent Thoracic Stent Graft System: The VALOR trial. J Vasc Surg 2008;48:546-54. 13）Matsumura JS, Cambria RP, Dake MD, et al. International controlled clinical trial of thoracic endovascular aneurysm repair with the Zenith TX2 endovascular graft: 1-year results. J Vasc Surg 2008;47:247-57. 14）Bertges D, Chow K, Wyers MC, et al. 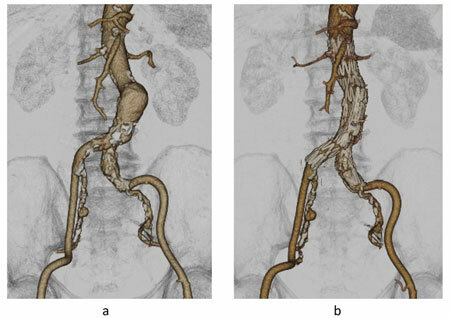 Abdominal aortic aneurysm size regression after endovascular repair is endograft dependent. J Vasc Surg 2003 37;716-23. 15）Haider S, Najjar SF, Cho JS, et al. Sac behavior after aneurysm treatment with the Gore Excluder low-permeability aortic endoprosthesis: 12-month comparison to the original Excluder device. J Vasc Surg 2006;44:694-700. 16）The EVAR trial participants. Comparison of endovascular aneurysm repair with open repair in patients with abdominal aortic aneurysm （EVAR trial 1） , 30-day operative mortality results: Randomized controlled trial. Lancet 2004: 364; 843- 48. 17）Prinssen M, Verhoeven ELG, Buth J, et al. A randomized trial comparing conventional and endovascular repair of abdominal aortic aneurysms. N Engl J Med 2004: 351; 1607-1618. 18）Schermerhorn ML, O’Malley AJ, Jhaveri A, et al. Endovascular vs. open repair of abdominal aortic aneurysms in the Medicare population. N Engl J Med 2008: 358; 464-474. 19）大動脈瘤・大動脈解離診療ガイドライン（2006 年改 訂版） Circulation Journal 2006: 70; s1569-1646. 20）Walsh SR, Tang TY, Sadat U, et al. Endovascular stenting versus open surgery for thoracic aortic disease: Systemic review and meta-analysis of perioperative results. 21）Stone DH, Brewster DC, Kwolek CJ, et al. Stentgraft versus open-surgical repair of the thoracic aorta: Mid-term results. J Vasc Surg 2006;44:1188- 97. 22）Criado FJ, Clark NS, Barnatan MF. Stent graft repair in the aortic arch and descending thoracic aorta: A 4-year experience. J Vasc Surg 2002;36:1121-8. 23）Zhou W, Reardon M, Peden EK, et al. Hybrid approach to complex thoracic aortic aneurysms in high-risk patients: Surgical challenges and clinical outcomes. J Vasc Surg 2006;44:688-93. 24）Shimamura K, Kuratani T, Matsumiya G, et al. Longterm results of the open stent-grafting technique for extended aortic arch disease. J Thorac Cardiovasc Surg 2008 135:1261-9. 25）Cambia RP, Clouse D, Davison JK, et al. Thoracoabdominal aneurysm repair: Results with 337 operations performed over a 15-year interval. Ann Surg 2002;236:471-479. 26）Chiesa R, Tshomba Y, Melissano G, et al. 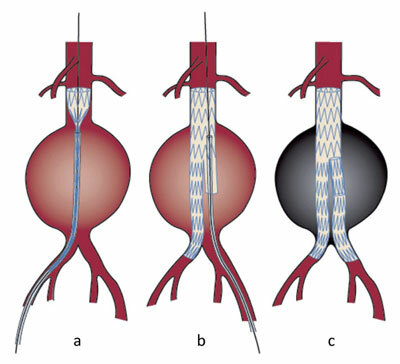 Hybrid approach to thoracoabdominal aortic aneurysms in patients with prior aortic surgery. J Vasc Surg 2007;45:1128-35. 27）Roselli EE, Greenberg RK, Pfaff K, et al. Endovascular treatment of thoracoabdominal aortic aneurysms. J Thorac Cardiovasc Surg 2007 133:1474-82. 28）Dake MD, Kato N, Mitchell RS, et al. Endovascular stent-graft placement for the treatment of acute aortic dissection. N Engl J Med 1999;340:1546-1552. 29）Hansen CJ, Bui H, Donayre CE, et al. Complication of endovascular repair of high-risk and emergent descending thoracic aortic aneurysms and dissections. J Vasc Surg 2004;40:228-34. 30）Nienaber CA, Fattori R, Lund G, et al. Nonsurgical reconstruction of thoracic aortic dissection by stentgraft placement. N Engl J Med 1999;340:1539-1545. 31）Kato N, Hirano T, Shimono T, et al. Treatment of chronic aortic dissection by transluminal endovascular stent-graft placement: preliminary results. J Vasc Intervent Radiol 2001;12:835-840. 32）Stanson AW, Kazmier FJ, Hollier LH, et al: Penetrating atherosclerotic ulcers of the thoracic aorta: natural history and clinicopathologic correlations. Ann Vasc Surg 1986; 1: 15-23. 33）Schoder M, Grabenwoger M, Holzenbein T, et al. Endovascular stent-graft repair of complicated penetrating atherosclerotic ulcers of the descending thoracic aorta. J Vasc Surg 2002;36:720-726. 34）Demers P, MillerDC, Mitchell RS, et al. Stent-graft repair of penetrating atherosclerotic ulcers in the descending thoracic aorta: mid-term results. Ann Thorac Surg 2004;77:81-86. 35）Kato N, Dake MD, Miller DC, et al. Traumatic thoracic aortic aneurysm: treatment with endovascular stent-grafts. Radiology 1997;205:657-662. 36）Tang GL, Tehrani HY, Usman A, et al. Reduced mortality, paraplegia and stroke with stent graft repair of blunt aortic transections: A modern metaanalysis. J Vasc Surg 2008;47:671-5. 37）Sachdev U, Baril DT, Morrissey NJ, et al. Endovascular repair of para-anastomotic aortic aneurysms. J Vasc Surg 2007;46:636-41. 38）Ting ACW, Cheng SWK, Ho P, et al. Endovascular stent graft repair for infected thoracic aortic pseudoaneurysms-a durable option? J Vasc Surg 2006;44:701-5. 39）Ikeda Y, Morita N, Kurihara H, et al. A primary aortoesophageal fistula due to esophageal carcinoma successfully treated with endoluminal aortic stentgrafting. J Thorac Cardiovasc Surg. 2006;131:486-7. 40）McIff EB, Smilanich RP, McIff D. EVAR in Community Hospitals. Endovasc Today 2006;5:52-60. 41）川口　聡、重松　宏　胸部大動脈瘤に対するステント グラフト内挿術Jpn J Intervent Radiol 2007;22:431- 435. © 2006 沖縄県医師会 All Rights Reserved.